Access your iTOL trees directly from Google Sheets or Microsoft Excel, and annotate them using familiar spreadsheet interface. Load existing annotations directly from iTOL, or start from scratch. Preload tree identifiers from iTOL, and never worry about finding the correct ID to use. Any errors in your data will be highlighted directly in Google Sheets or Excel, with helpful information popups. Use the error navigator to quickly go from one error cell to the next. Tooltips describe each field, making it easy to fill the correct values. Where applicable, values can be directly selected from a list of valid entries. Type the colors directly or use the integrated color picker. Cell backgrounds change to reflect the selected color. iTOL annotation editor is tool providing direct link from your favourite spreasheet software to your iTOL account. 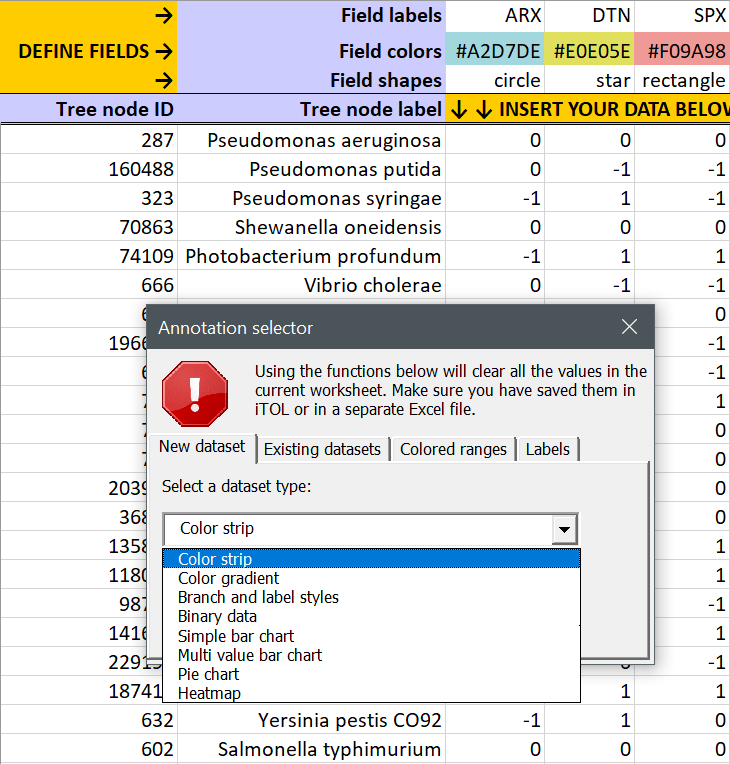 Simply access your trees directly from Microsoft Excel or Google Sheets, create new datasets, edit existing ones, define color ranges or update tree labels. Create or edit datasets directly in your spreadsheet, with full link to iTOL. Automatically load your tree node IDs, and save data directly to iTOL. 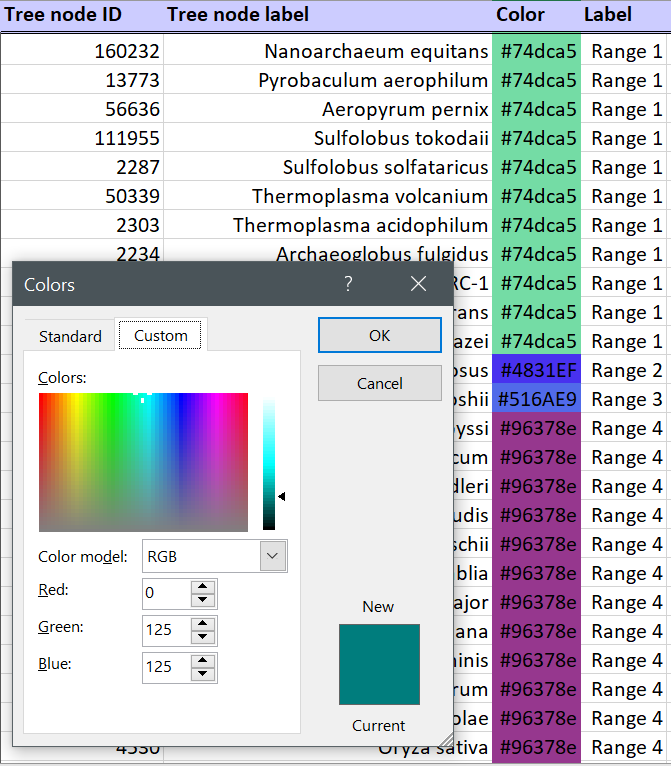 Use the integrated color picker to define colors in datasets or colored ranges. Cell backgrounds are automatically set to reflect the selected color. Get feedback on errors in your data directly in the spreadsheet. Invalid cells are highlighted and show helpful hints on the detected errors. 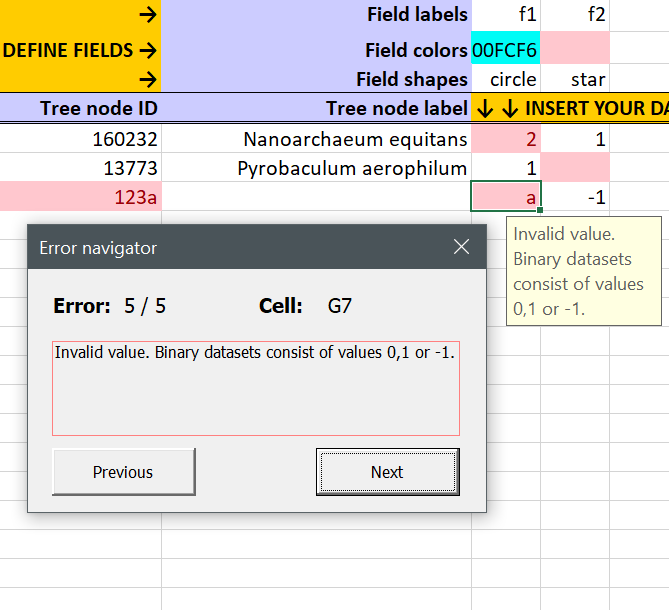 Use the Error navigator to quickly navigate among all invalid cells. 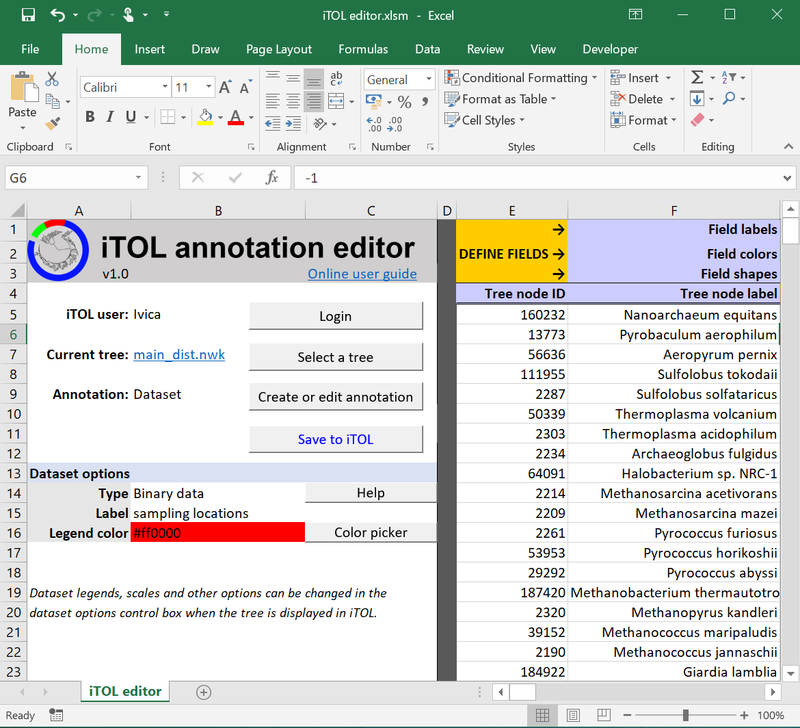 Full power of Google Sheets or Microsoft Excel tied directly with iTOL's robust tree annotation features. Full access to iTOL's most popular annotation features. 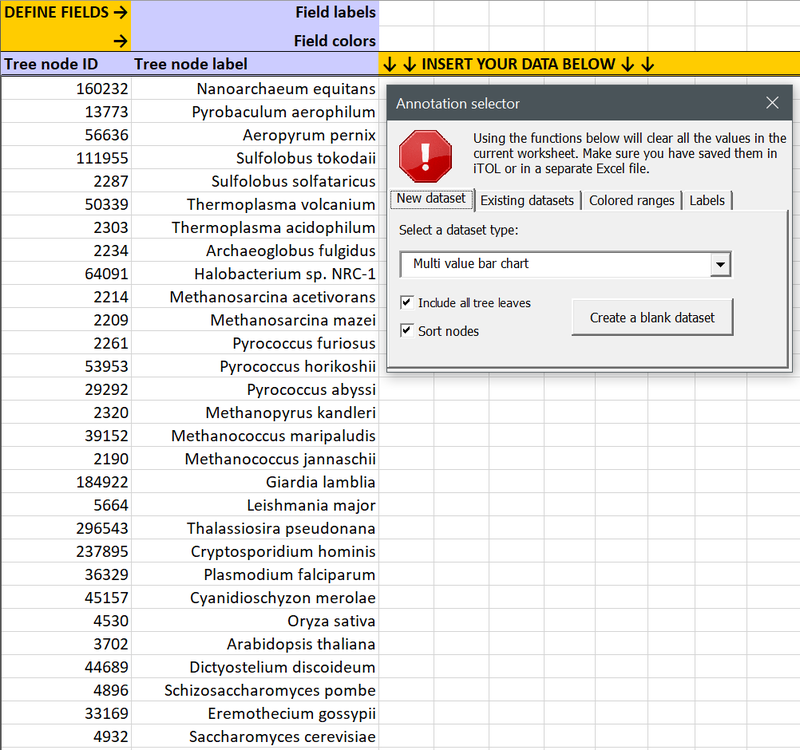 Create datasets, load tree IDs directly from iTOL and start working on your data. Save from the spreadsheet automatically into iTOL, without need for separate files or templates. 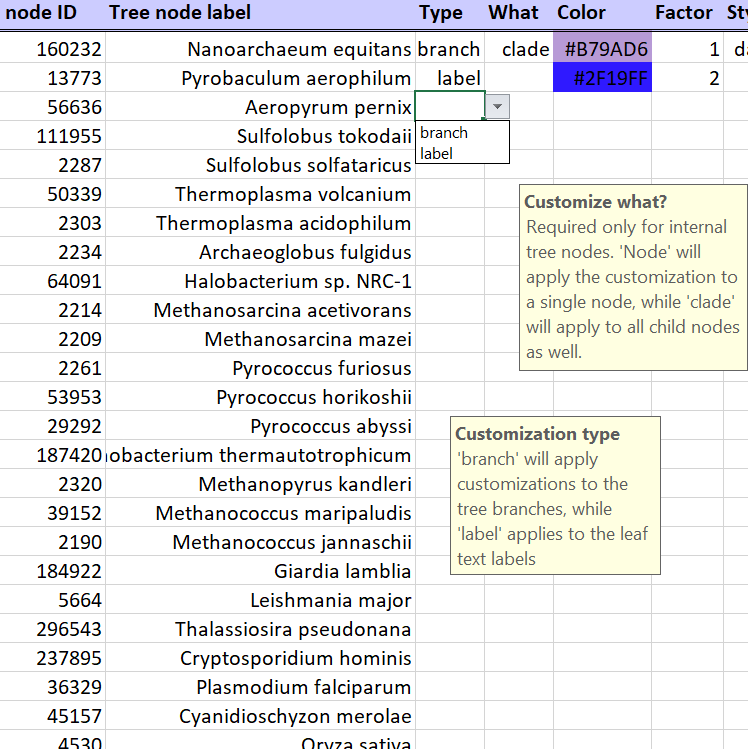 Load your tree in iTOL's web page to visualize the data. Helpful info popups and automatic data validation. Descriptions of various fields give helpful hints directly in the spreadsheet interface. Values for pre-defined field types can be selected directly through pop-down value lists. Error navigator simplifies the identification and correction of any problems in your data. All error cells are automatically highlighted and show the detected error when selected. An in-depth video tutorial, together with the description of all features and supported datasets is available on the help page. iTOL annotation editor works in trial mode by default, and will only save the first five rows of your data. For full unlimited access, subscribe using one of the options below. For institutional access, please have your librarian or IT administrator contact us. All subscriptions include unlimited access to both Microsoft Excel and Google Sheets versions of the editor. Microsoft Excel 1.2 iTOL editor v1_2.xlsm Full version of the editor, tested in Microsoft Office 2019. Microsoft Excel 1.1 iTOL editor for Excel 2011 v1_1.xlsm Some non-essential functionality was removed to make it work in older versions of Excel. Use this one only if the full version doesn't work. 1.2 Added support for the Connections and Shape plot datasets. 1.1 Added support for the Text labels dataset. Fixed an issue with single quotes in node IDs. If you have any questions or require help using the iTOL annotation editor, please contact me via email. Please read our Terms & Conditions carefully before using the iTOL annotation editor, or starting your subscription.